The Liturgy Committee encompasses all of the ministries that support the Liturgical celebrations of the Church. It is charged with examining liturgical documents and making recommendations that will enhance and promote active participation and appreciation of the Liturgy. The specific committees are listed below. The contact person(s) may be reached through the St. Jude Office at 302-644-7300. These young people (fifth grade and above) assist the priest and/or deacon during celebrations of the Liturgy. This devotional practice occurs monthly on First Friday. Those participating in this ministry recite the chaplet, and honor the Blessed Sacrament exposed at that time. This ministry is charged with enhancing the appearance of the church in keeping with the liturgical seasons. This includes floral arrangements, vestments, altar cloths, and other decorative enhancements. This ministry strives to involve our youth more fully in the liturgy as lectors, servers, ushers, musicians, presenters of the gifts. This ministry proclaims the Word of God in the readings at all Masses. This devotion to Our Lady and Exposition of the Blessed Sacrament is on the First Saturday of each month following the 7:30 AM Mass. This ministry is charged with providing music within liturgical celebrations. Cantor training and assignment, liturgically appropriate hymn selection, choirs, and musicians are part of this ministry. The members of this ministry are responsible for distributing the Body and Blood of Christ to the congregation at Mass and exposing and reposing the Blessed Sacrament according to liturgical directives and at the discretion of the pastor. These ministers visit those who are homebound, in the hospital or nursing homes to distribute Holy Communion, pray with them and bring them the well wishes of the parish community. Eucharistic Adoration is the worship of Jesus Christ present in the Blessed Sacrament. At. St. Jude The Apostle Church, the Eucharist is displayed in a special holder called a monstrance. People are welcome and encouraged to visit the Parish Chapel to pray and to adore Jesus in the Blessed Sacrament. Christ's great love for us was shown when he was crucified on the Cross to pay the penalty for our sins and give us eternal life. He loves us without limit, and offers Himself to us in the Holy Sacrament of the Eucharist. Can we not give Jesus a few minutes of love and adoration in return? The Parish Chapel is open Monday 6 AM through Saturday 12 noon and on Sunday from 11 AM to 7 PM. Consider stopping in for some quiet time with the Lord. This ministry is responsible for the preparation of the liturgy for daily Mass. This includes preparing the Sacramentary, Lectionary and readying the vestments as prescribed in the Ordo, and preparing the sacred vessels to be used during the Mass. This ministry is open to both men and women. 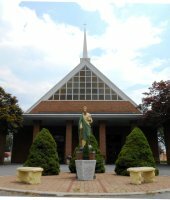 The focus of this parish group is to foster devotion to the Blessed Mother, through prayer, formation, teaching and good works. The members strive to honor Mary as the Mother of God and of our Church. This ministry welcomes and assists those who come to our Church. They are the ambassadors of good will and hospitality as they perform their ministry of greeting and seating people, and assisting with the needs of the various liturgies. They also see to it that the Church is ready for the assembly with doors unlocked, lights and microphones on, and pews ready for those who have come to worship. Ushers also select gift-bearers and facilitate offertory collections.